For those of you who enjoy DIY home improvement projects, we have some great tips. First, you can change the layout of your furniture in any room. Sometimes, even the smallest change can make a big difference! One idea is to move the furniture away from the windows to let in more natural light. Another tip is to remove any unnecessary furniture to help make a room look bigger. Simply getting rid of clutter can also make a world of difference. A unique one is 3D printers! Did you know you can use 3D printers to add quirky and interesting touches to your home? Currently, there's so much research and development ongoing in the 3D printing space. Hence, these machines are becoming ever more useful, capable, efficient, versatile and user friendly. While you and I may not be able to 3D print our own homes just yet, there is a lot we can create and customize with the help of 3D printers. Joshua Stellini, an artist and student at the University of Melbourne used his imagination and a 3D printer to create a unique two-in-one piece of furniture. He created a table that is also a comfy seat – a 3D table with cushiony, 3D printed seating surfaces. The device helped standardize processes and made labor simpler. And what can you do with a home 3 D printer? Amazon has home printers like a 3D pen to create doodles in the air. They are abstract masterpieces born out of your own imagination! You can also print fabricated parts using PLA filament, a nontoxic resin made of sugar from field corn. PLA filaments can create customized 3D models of various objects like toys, models and miniatures and more with the bigger machines with better features. You can also use scanning software to create a digital image of the object you want to create. For example, printing out a miniature of a vintage car (a nostalgic conversation starter!). Creating amusing and unusual toys for kids and grandkids is also another great idea. Another cool project is making one-of-a-kind jewelry. You can also make your own replacement parts and tools to your own required specification. 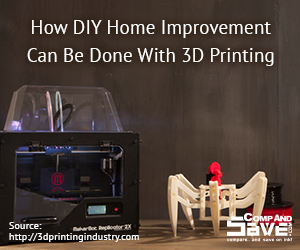 This article outlines some really cool household and home improvement items you can 3D print. For example: a wine rack, a drink dispenser, a portable combination safe, outlet protectors, unique penholders, bottle openers, coasters, wall mounts or hooks, even a shower head and so much more. If you're ready to go the DIY route with a 3D printer, there are services that will do this for you. For instance Lowe's Innovation Labs. Lowe's brings you a simple and fun experiences to design and make items for your home. This helps you customize objects such as knobs and handles for your home – items that can be as cute, quirky or unusual as you want them to be. For just $5 to $20, you can create unique wall prints, handles and other home improvement items. If you're willing to shell out more, there are more premium options. Like having a stainless steel, titanium and gold objects printed out to your specifications. Lowe's printing specialists will help you choose the color, the material and the shape of the unique objects you want to create. So how about printing an out-of-production antique? Or perhaps you have the fragments of a broken object that you loved? These can be pieced together to create a 3D model for printing so you can replicate it! Other organizations such as Singularity University Labs also helps in creating products for your business. Authentise Tech and Services is another service devoted to helping businesses find the kind of solutions they are looking for: designing and delivering 3D printing strategies and building tech to empower 3F printing and 3D design businesses. We love to hear about home improvement stories and DIY projects that our readers share with us. If you have any to share about any DIY 3D printing projects that you were involved in at home or work, we’d love to hear about those as well!